Fresh from the Oven: Sweet Giveaway! A few weeks ago, the nice folks at See's Candies dropped me an email to ask if I would be interested to create a dessert with their candies/chocolate. Not only are they sending me the goodies, they also agreed to give one of my readers a $25 gift voucher! Aren't they sweet? As you can see, I got some chocolate from their Easter Candy selection and will be making something with my friends at a party later. My initial plan was to post a dessert with this giveaway post, but it was a hectic exam week, so that didn't materialise. Also, I am hoping that the winner of the $25 gift voucher can have enough time to select candies from their Easter Candy selection. So this giveaway post has to come before I show you what I make with them. I am sure you don't mind that. Do you? To stand a chance to win $25 See Candies gift voucher, simply leave me a comment! The closing date is Tuesday 12:00a.m central time. A lucky winner will be chosen at random and announced on Tuesday morning. Good luck everyone! We love See's. It's hard to past them when we see one. I love the Toffeettes. Great giveaway! I love Easter candy! Mmm...Easter candy. Count me in! Oooh! I sure would love a voucher for these candies! They look great! I've never had their candies before, but they look cute and delicious (especially the dark chocolate)! I love See's candies. I'm glad that you are done with stressful exams. I'd love some sees candies to share with friends and add to my cupcakes! Thanks for sharing! Although my waistline could do without the treats, it would be nice to win (since I never win anything). Looking forward to seeing what you will be creating out of them. I love See's Candies. The Easter candies look beautiful. Would love to win the voucher!! Oooh, how pretty! See's Candies were always a favorite of my moms, but I don't think I've ever seen them so pretty! i love see's candies! i remember one time my ex-bf's aunt bought a box and no one ate them except for me! Does visitors from out of your country stand a chance to win as well? Mmmm. See's Candy. They have a fabulous reputation and yet I've never ever seen a place where they are available. I'll be interested to see what you come up with! I've always wanted to try See's! Wow those look delicious :D I adore your blog and can't wait to see what you make with them! You can never get enough of See's Candies! I Love See's. A colleague sent me a box for Christmas one year, and I was hooked. Their chocolate looks awesome. I'm hungry now! Do enter me please. Hi Mandy, What fun! I hope your exams went well, I love reading about all your pastry school adventures. I can't wait to see what you created!! Very nice giveaway! I love See's lolly pops. I used to get them from a family friend when I was younger and they're my all time favorite. I'll keep my fingers crossed and hope I win :) Thanks! I wish we had See's in the midwest. I need some bordeauxs! Love all your stuff! Love See's candy too! Fun giveaway! See's candy has always been my family's favorite. I can't wait to see what you come up with! Great giveaway!!! Mmmmm a basket with chocolates... So sweety!!! I've seen a big candy house before in Bangkok, very SWEET! I love Sees -- would love some in my Easter Basket! Ooooh! Those look really cute...& tasty. I always crave chocolate in the morning! Can't wait to hear how you did on the rest of your exams. Please count me in--I have never had See's candy!! I would love to try some!! Their lollypops are yummy. Count me in! I love See's candies, but don't have a source anywhere close. I'd love to win this so that I could FINALLY taste See's Candy! I adore See's Candies! They have the best stuff. I could their chocolate pops all day. See's is my favorite candy! I've never tried their Easter candies, but they look divine. Great giveaway, I lvoe chocolate. Love the chocolate and almond covered toffee from Sees! I love sees, it's a horrible thing that we don't have them in Texas. I end up filling my suitcase with a couple of the variety boxes every time I visit California. See's was one of the highlights of the years I lived in California. I wish they'd expand their stores to the coast I live on now. Can't wait to see what you come up with. Thanks for sharing your ideas and inspiration. See's candies are classic. A lot of people have very fond memories of them from childhood. I'm not so lucky but discovered them later in life. Better late than never! See's has some of the best candy! My grandma recently passed away and she absolutely loved See's. It's fun to eat them and remember special moments with her :). Oooh wow!! I love See's candies!! All of them. Just looking at them and smelling them...SIGH. Who doesn't?! I am excited to see what you do with them. Yummm-mmy! Thank you for your blog and have fun! I hope I win! Thanks for giving us, your readers this opportunity and also See's Candies! Oh, how wonderful! Count me in, I'd love to be entered in your sweet giveaway! I have really enjoyed reading your posts. Thanks for the inspiration. Also, a perfect opportunity to ask which pastry school you attend? I have been dying to try See's candies. Can't wait for your recipe post! I love chocolate! And when it's free it's even better! The one and only time I had See's was about 4 years ago when I was in San Diego visiting my aunt. I would love to be able to taste it again, it's amazing. I always say "See's or Fannie Mae's" and then answer---"both"
Mandy, I would love to have some sent to Singapore ~ choc for me anytime... Dessert dish or petit fours you are planning? 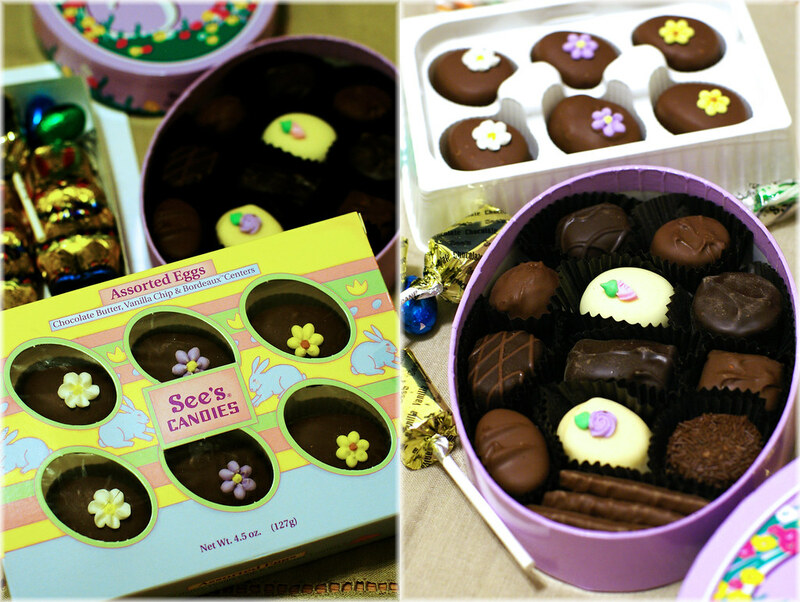 I'm on a diet,but I would love to share some See's candies with my family for Easter. Thanks.